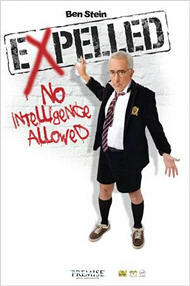 Yesterday, my wife and I watched the Ben Stein docu-movie Expelled; No Intelligence Allowed. We would have seen Expelled earlier but it was not playing in any theaters within 85 miles of here until the a day or two before we went to Turkey. I have long found Ben Stein intriguing as years ago as I occasionally watched his old game-show titled Win Ben Stein’s Money. Humorous film clips punctuate the movie, making what many might think a dry academic topic for theater-going into a smart romp and most enjoyable experience. Audiences are applauding as credits roll, and people are leaving theaters empowered as they perceive a mighty chink has now been made in the armor surrounding our culture’s impenetrable, atheistic, Darwinian monopoly. There is little doubt that evolutionary belief and atheism go had in hand, as one after another of its intellectual proponents admit this to Stein. When Darwinism is embraced, atheism is sure to follow as death follows decapitation, and this fact appears born out as the elite interviewees confess the sequence in their own lives and careers. One Cornell University professor in the movie positively conceded that the end result of accepting evolution was, for him, the realization that there is no free will and no after-life. This seems a peculiar and irrationally happy reaction to the prospect, and thinking people everywhere would find this a rather undesirable state of affairs if true. So much is at stake, and the conclusion of the godless mindset is neither certain nor very scientific. In addition, Stein noted that “evolution’s top apologists have switched from defending Darwinism to attacking religion,” and this is really the thing upon which the movie most concentrates. Is the United States a freedom loving, free-thinking, intellectually inquisitive nation of cordial academic pursuit, or is it a politically correct, closed-minded arena of thought controlling, in-crowd Neanderthals? The latter seems to be the conclusion of internationals, and the audience will draw the same conclusion as professors and educators present their tales of discrimination, blacklisting, and defamation at the hands of the American evolutionary juggernaut and its related tentacles. The Berlin wall is also included as something of an illustration for what our own culture is doing with regard to scientific dissent. The East Germans walled out the western ideas that might get across and upset its prevailing communistic philosophies, and so our own culture has erected non-material walls against one informed dissenting hypothesis, namely, Intelligent Design (ID). Although I think it would have been more effective with several changes, I thought that Ben Stein’s film did a good job of pointing out how many are so afraid of the truth that they will often conspire against those who advocate it and use ridicule to try to prevent others from understanding views that differ from the mainstream. I also liked the fact that the film pointed out how Adolf Hitler used extermination techniques consistent with Darwin’s views, and the fact that the acceptance of Darwinism is a major factor in both atheism (which I believe can be dis-proven, please see Is God’s Existence Logical?) and support of abortion (information on abortion can be found in the article Abortion, the Bible, and a Woman’s Right to Choose). I would ask Him why he made Himself so hard to find. Ben Stein (as well as the Protestant reviewers I have read) let that answer pass, but I will not. The fact is that most people do not realize that God is only calling a relative few now and will call everyone else later. That is why many feel He is hard to find. The fact that some few are called now and the rest will have their opportunity later is one of the most important teachings of the Bible, yet Catholics and Protestants simply do not get it (some of the Orthodox, however, do). This entry was posted on Monday, May 19th, 2008 at 6:06 am	and is filed under Doctrine.